Once inside the main entrance, a network of paths takes the visitors round the sides of the circular garden on different levels, and just getting around all of them and seeing all of the cacti can take a good hour. The levels actually go down below the level of the entrance building and car park, so it is like being in a hidden – almost secret – garden. And the plants are not the only cacti present. Many of the features such as the doorhandles also have a ‘cactus’ design. At the far end of the garden there is a small lake and a café, behind which a flight of steps goes up onto the outer wall of the garden and to a restored windmill. 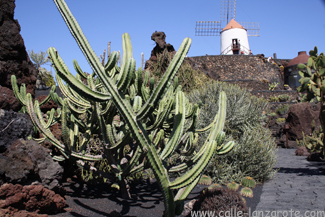 From here there are breathtaking views across the cactus fields towards Arrieta and Costa Teguise, as well as out into the Atlantic. It is also possible to go into the windmill and climb up even further inside that too. Finally there is a gift shop selling cacti, seeds to grow them from, and various associated products. 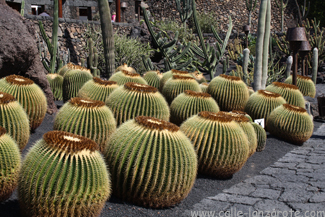 But as tempting as it may be to take a souvenir of your visit to the cactus garden back home with you, you might like to check up with your local customs office before you go on holiday to ask if you are allowed to bring cacti back with you. Of you might just like to be on the safe side as I did and buy a book instead. This entry was posted on Thursday, March 8th, 2012 at 12:19 am	and is filed under Places to visit. You can follow any responses to this entry through the RSS 2.0 feed. You can leave a response, or trackback from your own site.